The North Carolina mining and mineral industry has over 800 active permitted mines, annual sales in excess of $800 million, and an estimated employment of over 100,000 (including service and ancillary organizations). The 2007 Minerals Yearbook for North Carolina, the latest report available from the U.S. Geological Survey, values nonfuel raw mineral production at $1.2 billion for the state. With the overall direct and indirect economic impact of mining in the state of nearly $11.3 billion annually, mineral resources also represent a key component of the economy in the Mountain Resources Commission (MRC) region. 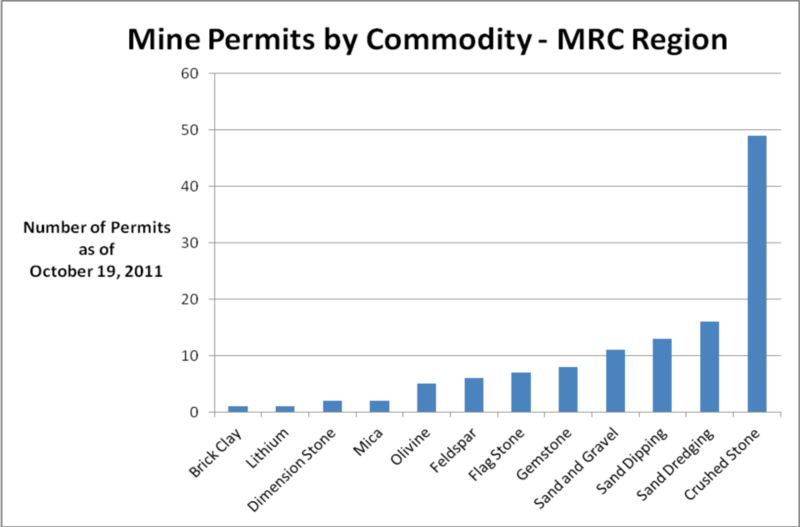 As of October 2011, 101 out of the 121 MRC permitted mines remain active, helping to assist North Carolina lead the world in the production of high-purity quartz and in leading the nation in production of feldspar, mica, and olivine. The value of crushed stone reported by the U.S. Geological Survey in 2007 for the 21 Western North Carolina counties in Region 1 (MRC counties excluding Alexander, Alleghany, Cleveland, Surry, Wilkes, and Yadkin) was $155 million, or ~17 percent of the state’s total. The 2007 value of construction sand and gravel for Region 1 was $5.73 million, or ~9 percent of the state’s total. The Minerals Research Laboratory (MRL) of North Carolina State University serves as a world-class mineral research and processing facility. Located in Asheville, the MRL works with domestic and international private industries and collaborates with the North Carolina Geological Survey (NCGS) on state-sponsored mineral resource projects. With a long history of mining in Western North Carolina, the U.S. Geological Survey Mineral Resources Data System (MRDS) has recorded past mining activity at 1,290 locations in the MRC region. These data are important for documenting the locations of mineral resources for potential future re-use, and for exposing potential hazards such as those that could be associated with abandoned underground mines. This information is routinely accessed by mineral exploration and investment companies and engineering and environmental firms from the NCGS office in Asheville. Those planning to alter one acre or more of land for the purpose of mining must obtain an approved mining permit, as required by the North Carolina Mining Act of 1971. The application must include a description of proposed land use and maps on the area of interest, as well as a reclamation plan for the restoration of all affected land. The Division of Land Resources, Land Quality Section administers mine permitting and mining regulations. Clay. Kaolin is recovered as a by-product of mica beneficiation in Avery and Cleveland Counties. Most of it is used in the manufacture of white-colored brick. Crushed Stone. Crushed stone has been a leading mineral commodity by value and tonnage in North Carolina and the mountain region. Granite and other crystalline rocks in the Blue Ridge geologic belts provide the principal sources of crushed stone in North Carolina. This resource allows Buncombe County to be among the state’s leading producers of crushed stone. Additionally, dolomite, crystalline limestones, and marble are quarried in limited amounts in the mountain region. Dimension Stone. The North Carolina Granite Corporation operates one of the largest granite dimension stone quarries in the world at Mount Airy, in Surry County, and their operation includes a finishing plant located on site. Mount Airy granite is used as street curbing, ashlar for masonry walls, rubble, rip-rap, monuments, and sawed slabs for buildings. There is great foreign interest in this local commodity, as large cut granite blocks are a common export to China. Feldspar. Obtained originally from pegmatites and granitic bodies, feldspar was first mined in North Carolina in 1911 in the Spruce Pine district, the primary feldspar-producing district in North America. Found largely in the Kings Mountain area of Mitchell County, the mineral is used to create a feldspar-silica concentrate during mica beneficiation. Other uses of feldspar include the production of whiteware, tiles, glass, and fiber insulation, and it is used both in the body of the ware and in the glaze of ceramics. Garnet and Corundum. Significant reserves of garnet reside in areas of Western North Carolina. Associated with ultramafic rocks, corundum was studied in the early twentieth century for its use as an abrasive material. Given this, the NCGS and the MRL are in the process of investigating the abrasive potential for garnet minerals. Gemstones (Natural). North Carolina has long been famous for the variety of precious and semi-precious stones found in the Piedmont and Mountain regions of the state. A 64‐carat cut emerald known as the “Carolina Emperor” was found in 2009 in Hiddenite, Alexander County, a prominent site for commercial emerald mining. The raw stone weighed 310 carats and was two inches square, and when finished the cut stone is valued close to $1.5 million. With the help of this find, the area is emerging as a high-quality emerald district of worldwide significance, and the find has prompted several dozen commercially-operated collection localities to open to the public. Motivated by the commercial successes, amateur collectors try their luck at finding emeralds, rubies and sapphires (gem-quality corundum), hiddenite, garnet, and other semi-precious stones. This public participation has helped North Carolina rank first in the East in the mining and marketing of gemstones and mineral specimens. 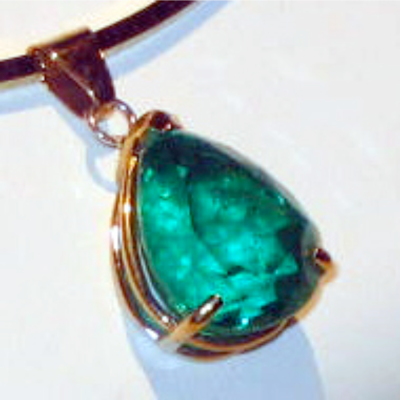 Primary gem-collecting counties include Alexander (emeralds and hiddenite), Macon (rubies, sapphires, and garnets), and Mitchell (emeralds and aquamarine). High-Purity Quartz and Glass Sand. The Spruce Pine district in Western North Carolina is the only producer of high-purity quartz in the world, amounting to 90% of all mined and processed quartz for use in the electronics industries. The three principal markets for this high-purity quartz include electronics for semiconductors, solar markets for the production photovoltaic cells, and applications in the lamp tubing market. 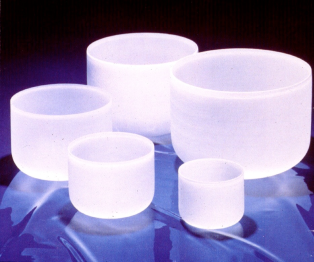 As an example, Unimin Corporation, with its IOTA-branded quartz from Spruce Pine, is a worldwide supplier to the glass, ceramic, and lighting industries, to oil and natural gas service companies, and to paint, plastic, rubber, and composite manufacturers. Additionally, quartzites of the Chilhowee Group in northern McDowell County have potential to be a source of high-silica material. Mineral dressing data show the silica concentrate is suitable for plate glass and container glass and, upon further grinding, as a source of fine-ground silica. Quality quartz is also produced in the Kings Mountain district. Lithium (Spodumene). Although first recognized as early as 1906, the economic significance of the spodumene-bearing pegmatites of the Kings Mountain district was not realized until 1942. Today, this relatively small area in Cleveland and Gaston Counties contains ore reserves that represent more than 80 percent of known lithium (spodumene) reserves. Lithium (spodumene) mineral production ceased with the 1998 closure of the FMC Corporation mine south of Cherryville. The overburden is currently being processed for aggregate. FMC’s Lithium Division produced a full range of downstream compounds, lithium metal, and organic lithium compounds at its facilities in Bessemer City, North Carolina. Lithium is also used in the manufacture of ceramics, glass, greases, television glass, and batteries. Rockwood Holdings, Inc. has announced that the expansion of its lithium production operation in Kings Mountain is proceeding to construction. The project is funded in part by a $28.4 million grant from the U.S. Department of Energy to expand and upgrade the production of lithium materials for advanced transportation batteries. When completed, the expansion will be a state‐of‐the‐art facility to produce battery-grade lithium hydroxide. Currently, the site produces other lithium salts and lithium metal for primary batteries. Marble (Limestone). The two main producers of marble (metamorphosed and recrystallized limestone) in the region are the Hewitt mine in Swain County and the Fletcher Limestone Company Quarry in Henderson County. The Hewitt mine is in the Murphy marble belt and the Fletcher Quarry is in a marble body within the Brevard Fault Zone. Both facilities produce crushed stone for aggregate used in road construction. The Fletcher Quarry also produces ultra-fine calcium carbonate for a variety of uses, including agriculture, civil engineering, water management, chemical production, and in the steel industry. Processed spoil material is marketed as quality foundation fill for roadways and small buildings. The Hewitt mine also produces landscaping stone and finely crushed material for use in concrete. The Murphy marble belt in Cherokee County was mined extensively in the past. Dolomite, a type of limestone that contains magnesium, was formerly mined in McDowell County. Limestone was formerly mined in the Kings Mountain area in Cleveland County. Mica. Mica mining began on a large scale in Western North Carolina around 1868 and the region has grown to become the most important producer of mica in the country. Sheet mica was the principal product for many years, but other materials have eliminated many of the uses for sheet mica. 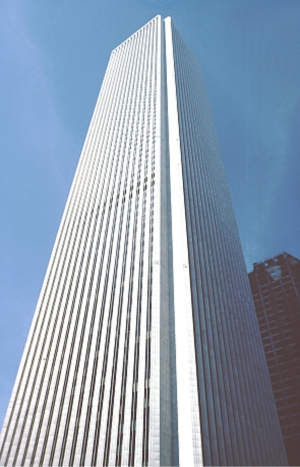 Consequently, North Carolina has not produced significant amounts of sheet mica since about 1962. Flake or “scrap” mica is still produced in large quantities, with granitic rocks being the primary sources. North Carolina leads the nation annually in the production of flake “scrap” mica, accounting for about 60 percent of the country’s total production. Primary production occurs in Mitchell County in the Spruce Pine district, and in Cleveland County in the Kings Mountain district. Mica is also produced as a co-product of feldspar, silica, and kaolin mining. Mica is used primarily in the manufacture of gypsum plasterboard joint cement, wallboard and well-drilling muds, cosmetics, paint, and plastic manufacture. Olivine. Occurring as isolated dunite bodies associated with other ultramafic rocks, olivine reserves in the Blue Ridge have helped North Carolina to lead the nation in overall olivine production. Two main districts, the Webster-Balsam district in Jackson County and the Spruce Pine district in Yancey and Mitchell counties, have produced most of the olivine in the region’s past. With production dictated by economic conditions, active olivine reserves are presently limited to the Daybook Mine in Avery County and other locations near Burnsville in Yancey County. A refractory, olivine can maintain its strength at high temperatures and is often used in foundry furnaces as a reliable molding sand. Given this ability, studies are underway to determine its potential in heat-storage blocks for furnaces and as a silicosis-free alternative to quartz in sand blasting. The use of olivine as a fluxing agent has declined in recent years due to the decline in overall steel production, as well as from increased competition from other olivine imports. Rare Earth Elements (REE). Industrial demand for rare earth elements has increased for its applications in high technology and alternative energy sources. Uses include magnets for wind turbines, metal alloys and components for electric vehicles, computers, energy-efficient lighting, and advanced materials for defense systems. The mineral monazite was mined for thorium from placer deposits in Burke, Cleveland, McDowell, and Rutherford Counties until the early 1900s. Monazites can also contain neodymium, a rare earth element used as a component in the alloys used to make high-strength, permanent, neodymium magnets. The mineral deposits occur mainly in valleys between the Yadkin, Broad, and Catawba Rivers, including the Shelby area, some of which have been mined for gold. Mining has ended not due to exhausted mineral, but due to lower costs associated with REE extraction in Brazil and India. Hafnium was mined with mica at a location in Mitchell County. Talc. The principal talc deposits are associated with the Murphy marble belt in Cherokee and Swain Counties, and with ultramafic rocks and soapstone in Madison County. Talc and soapstone were used as a refractory material and filler, but are no longer commercially mined. Sand and Gravel. In Western North Carolina, Buncombe County is the largest producer of sand and gravel. Their primary application occurs in construction materials, such as in concrete aggregates, asphaltic concrete, and fill. Industrial sand is obtained during feldspar and lithium beneficiation in the Spruce Pine and Kings Mountain areas. Most of the sand is used in the container and flat-glass industries, and also for the ferrosilicon, filtration, sandblasting, and traction industries. Uranium Minerals. A number of the uranium-bearing minerals occur as minor constituents in pegmatites, found principally in the Spruce Pine district and adjacent areas. Radioactive minerals have been found in northern Burke, Mitchell, and Avery Counties, but are found to exist in quantities too small to be of commercial value. Metallic Minerals. Metallic minerals are associated principally with the igneous and metamorphic rocks of the Piedmont and Blue Ridge geologic belts, with ores of aluminum, chromium, copper, gold, silver, iron, lead, zinc, manganese, tin, and titanium, found principally in the Mountain province. Although they bear little importance to the state’s mining industry today, significant amounts of gold, copper, and iron and were produced in the region’s past. Recreational gold panning, however, is a popular and sometimes profitable activity in the region. Copper was mined principally in Ashe, Jackson, Macon, Swain, and Watauga Counties in mines containing sulfide-bearing rocks, thus having the potential to produce acid runoff. Given this hazard, the U.S. Environmental Protection Agency placed the Ore Knob mine in Ashe County on the national priorities list of Superfund sites in 2009, in part because of contamination in surface water and groundwater from acid runoff and due to the potential instability of the tailings impoundment. Long, K.R., B.S. Van Gosen, N.K. Foley, and Daniel Cordier. 2010. "The principal rare earth elements deposits of the United States–A summary of domestic deposits and a global perspective." U.S. Geological Survey Scientific Investigations Report 2010–5220, 96 p. Accessed from: http://pubs.usgs.gov/sir/2010/5220/. North Carolina Geological Survey. Accessed from: http://www.geology.enr.state.nc.us/Mineral%20resources/Mineral_Resources.html. North Carolina Geological Survey. 2006. Proceedings of the 42nd Forum on the Geology of Industrial Minerals, May 7-13, 2006, Asheville, NC, USA, Information Circular 34, edited by J.C. Reid, 551 p.
North Carolina State University, College of Engineering, Industrial Extension Service Minerals Research Laboratory. Accessed from: http://mrl.ies.ncsu.edu/index.html. Reid, J.C. 2006. "North Carolina: An industrial mineral storehouse." In Proceedings of the 42nd Forum on the Geology of Industrial Minerals, May 7-13, 2006, Asheville, NC, USA, Information Circular 34, edited by J.C. Reid, pp. 17-39. Reid, J.C. 2010. State Mineral chapter, U.S. Geological Survey, North Carolina Geological Survey. U.S. Environmental Protection Agency. Accessed from: http://www.epa.gov/region4/waste/npl/nplnc/oreknobnc.htm. U.S. Geological Survey Minerals Resources Data System. Accessed from: http://tin.er.usgs.gov/mrds/. U.S. Geological Survey Minerals Yearbooks for North Carolina. Accessed from: http://minerals.er.usgs.gov/minerals/pubs/state/nc.html.